Spread your wings, my dear flamingo! Let's fly together to a pink wonderland, just you and I. Let's go to a mystical garden with just pink creatures. We are pink from head to toe. You are made of glitter, I am dressed in silk. Do you ever dream of being a beautiful bird with colourful feathers? Among all the birds, there are not many with pink feathers and that's why the flamingo has a special fascination. I can't transform myself into a bird, but a dream came true when this amazing flamingo headpiece from Pearls & Swine arrived in my life. When I put it on my head for the first time, I had to jump into the air, overfilled with joy. I can't understand why a lot of people never even consider to wear a headpiece or fascinator, while I want to put everything what I like on my head. Why bothering with small brooches or necklaces if there is so much space on your head for something big and bright? A headpiece can be very playful and fun: Be the flower girl with a crown of roses, say goodbye to dark days with colourful pompoms or decorate yourself with a beautiful flamingo, just as I! 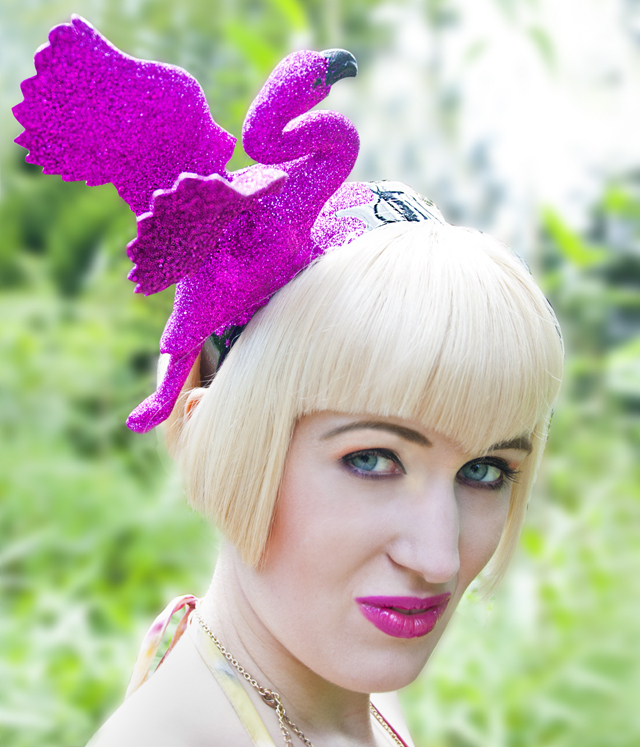 Wearing my flamingo headpiece makes me feel different, it changes the ordinary girl into something extraordinary. 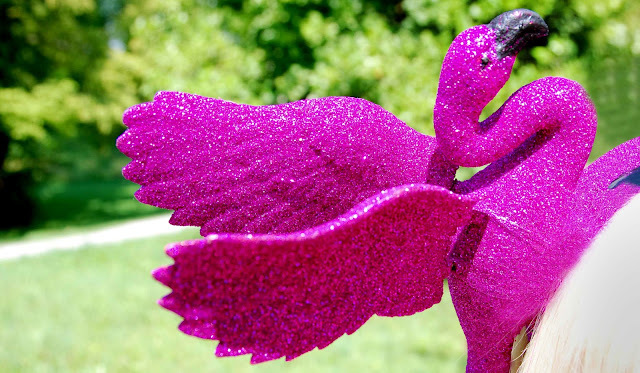 The wings move slightly when I walk and the pink glitter sparkles in the sun. The colour is very flashy and powerful. Fit for a flamingo fairy. Of course you can't buy something as beautiful as this in a department store, but that makes it even more precious. I am very happy, that I found my personal favourite hatter: Pearls & Swine. Run by lovely Bink. This shop is a true wonderland and wearing the things makes you feel like a queen. Not just the creations from the homepage are great, the best is to talk to Bink and make your personal hat dreams come true with a bespoke piece. My favourite animal (besides the cat) is the flamingo, so that was my wish and of course Bink made it come true. The shiny bird was made better than I could dream of. I am in flamingo heaven now, where everything is pink and pretty! What do you think about this headpiece and what is your own hat dream? Melons, bananas, grapes or strawberries? Let's start with a juicy piece of melon. Perfect summer feelings and the right weather to show a little bit more skin than usual. Feeling a little bit like a blond version of Frida Kahlo with all the flowers in my hair and huge earrings. 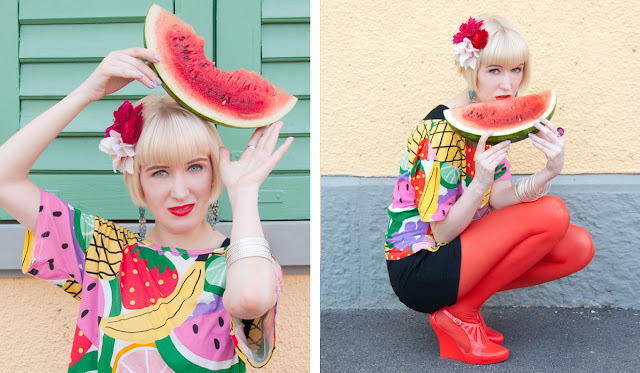 Two ways to wear the fruit t-shirt. A ring like a ripe, purple grape and loads of bangles for much bling-bling in your life. A melon not meant to eat, but to carry your belongings. 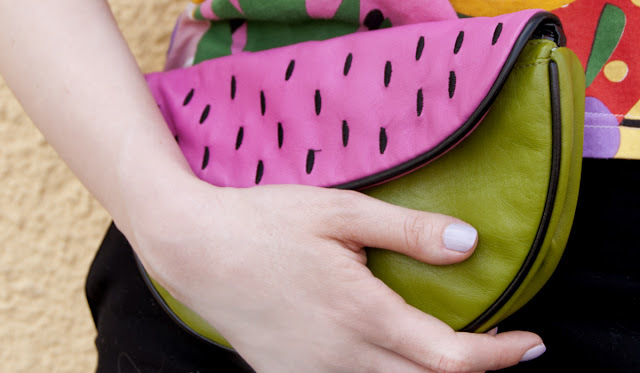 There is even a melon-shaped purse hidden inside. What is the acme of happiness? Maybe it's something simple: Sometimes I imagine it's a bowl of colourful and funny fruits sharing each others company. What could be merrier and filled with more lust for life? Fruits always seem to me like happy little things, healthy all over and always smiling at me. No matter if bananas, melons, strawberries, pineapples or grapefruits, they all have interesting shapes and very joyful colours. That's exactly why I love this mixed fruit t-shirt from Lazy Oaf so much: It's covered in fruits all over and brings fun into every wardrobe. The design reminds me of my teenage years with it's clearly 90s inspired style. While wearing it, I instantly feel better all the time. The fruits seem to enlighten and brighten up my mind and skin. Being dressed in brown and beige is really not my cup of tea, I prefer going crazy for melons and bananas! 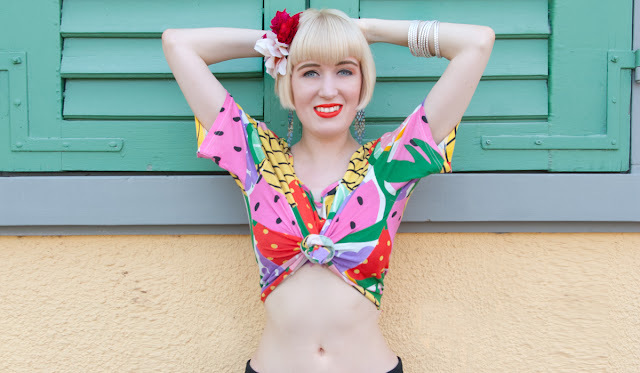 Besides the 90s I have to think of cheeky Carmen Miranda a lot, while wearing this outfit. 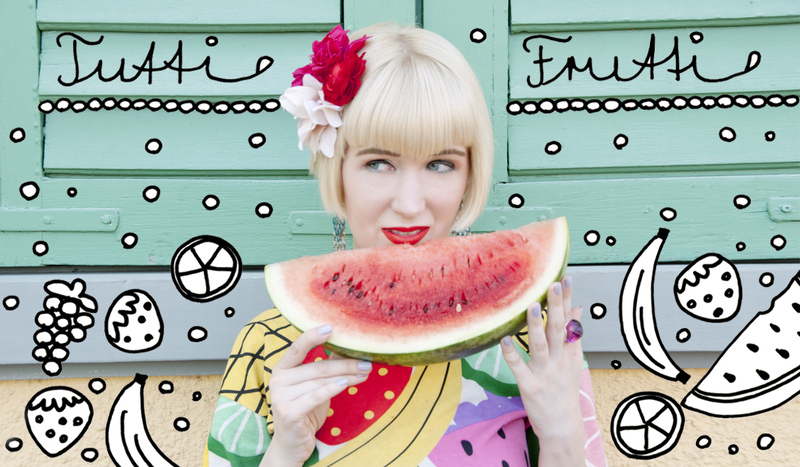 The gorgeous and unforgettable lady with the Tutti Frutti hat. In case you haven't seen her in her fabulous hat, now is the moment! This video is so amazing, everyone should watch it at least once in a lifetime. I regret that I didn't think about her, when I wrote my post about "Fabulous Hats in Movies" (sadly it's in German for all the English readers). This breathtaking hat should have been in the Top Three! My mixed fruit t-shirt is clearly not as extravagant as her hats, but perfect for a day at work or in the city, just for every day! Go for one too if you could use a little bit of happiness in your wardrobe! Batgirl is happy that she found her perfect bodysuit. Dressed as a heroine the adventures in the city may begin. Someone needs to watch over the city. Maybe Batman will come around and join me. Are there any bad guys out there? I catch any villain for sure with my claws. When everything is calm and silent I disappear between the buildings, into the darkness. The city is safe during Batgirl's watch and everyone can live without fear. A mighty hero has special abilities and uses them to save the city and humanity. Who doesn't adore the comic heroes and heroines such as Batman, Spiderman or Wonder Woman? They experience amazing stories, full of tension and valour. From all the comic book heroes, Batman has always been my favourite. He has style, elegance and he can melt into the shadows with his cool black suit. Batman drives the coolest Cars and he lives in a huge manor. He's a true Mister Perfect, don't you think? My excitement for this character was awaken again when Christopher Nolan's third Batman movie was close to come to the cinema. A few weeks ago, Lazy Oaf announced their release of a Batman Collection. Of course I had to go for something from this collection straight away. 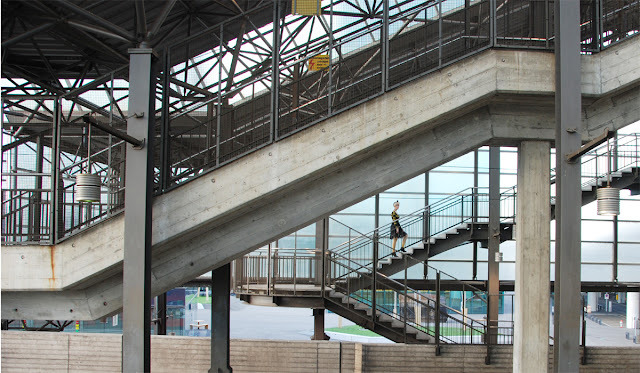 There are many beautiful clothes and accessories for men and women, which made the decision difficult. In the end, my choice fell to this marvellous bodysuit. Every real heroine needs a bodysuit, don't you think? 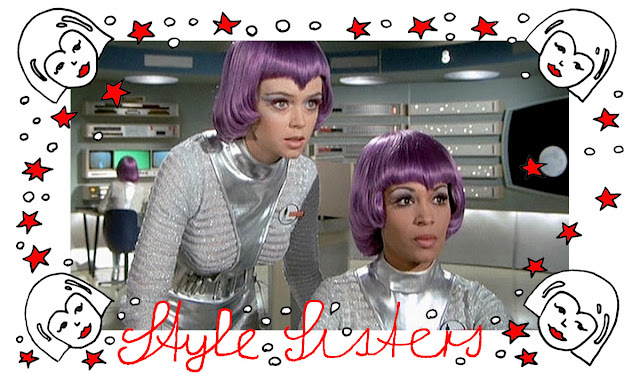 Heroines don't wear shirts, but always skintight suits. 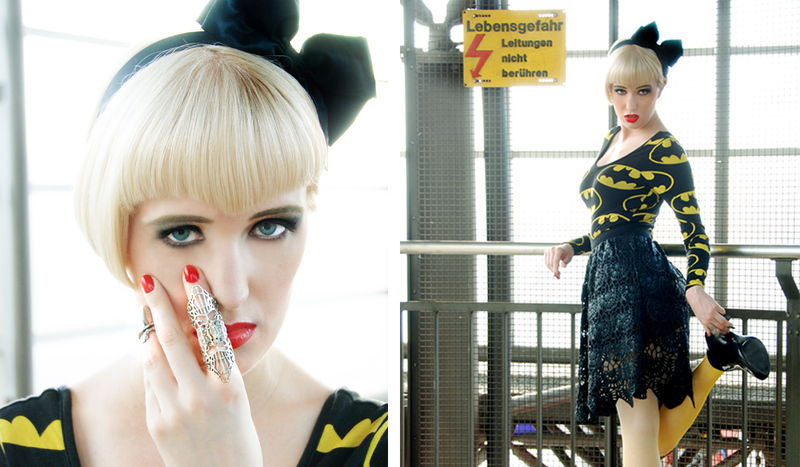 Last weekend, my darling and me went to see the new Batman movie. Me in this outfit, he went for a batman t-shirt as well. People must have thought us being the biggest fans in the cinema. I am very glad that the movie didn't disappoint us and I can proudly continue to wear my suit. The Batman logo from the 90s is shown on the suit and I must say, I still prefer this to the new version of the logo. This one puts me back into the bubbly fantasy world of Tim Burton's Batman. 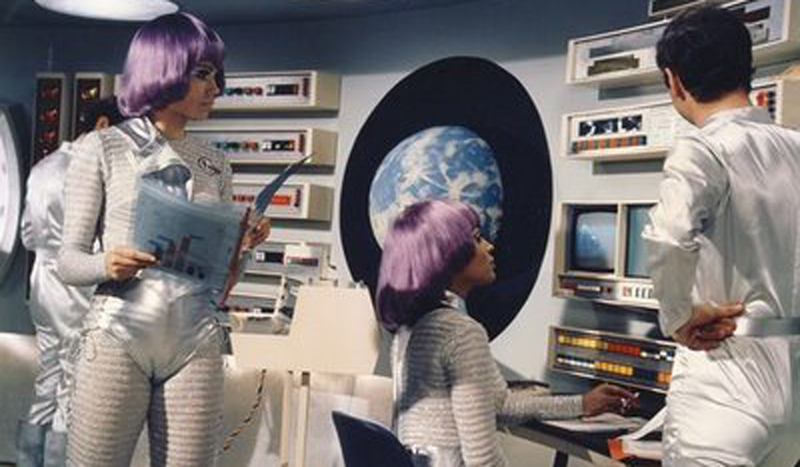 It's far more colourful and quirky than Christopher Nolan's more realistic version. If I would be in Burton's Batman universe, I would be a bad, bad Batgirl and take the Penguin's swan boat out for a ride, invite Michelle Pfeiffer dressed as Catwoman to join me and listen to David Bowie's song "Heroes" together. 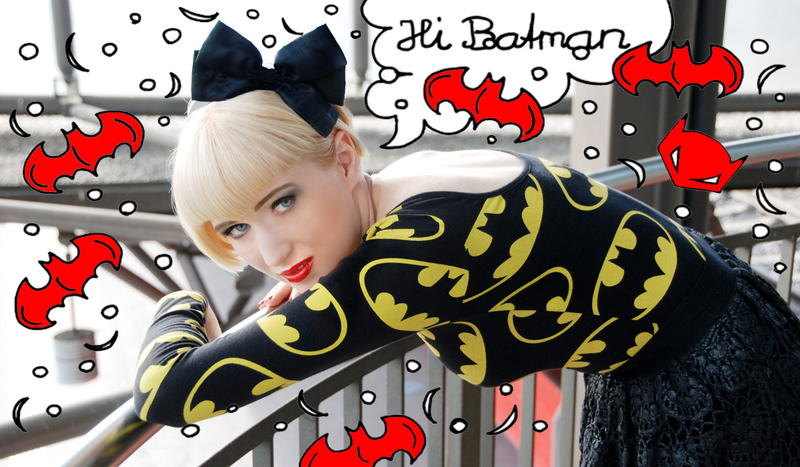 Which is your favourite comic book hero and are you in love with the Lazy Oaf's Batman Collection too?